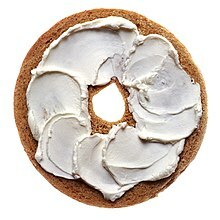 A bagel with cream cheese, a light breakfast meal in some parts of North America. Breakfast is the first meal of the day, eaten in the morning to break the fasting period of sleep. Breakfast traditions vary greatly around the world, from the minimal Café au lait of France to the hearty spreads to the substantial English Breakfast. A breakfast should provide enough energy to realize the daily activity until noon or lunch but it should also be light enough as to be easy to digest. For a complete, automatically generated, list of recipes which have been categorized, on their individual pages, as being breakfast recipes, see Breakfast recipes. Wakeup Sausage Casserole AKA "Sausage Tossage"
This page was last edited on 17 August 2014, at 15:43.